The Riverview – 3 bedrooms 2 bathrooms and loft area – very special space with huge kitchen, floor to ceiling fireplace, large decks and patios overlooking the river – hot tub, playground, tree house. Enjoy our Riverview Home on the Lillooet River! There are 4 bedrooms, 2 bathrooms and a loft area, great room, dining room and large country kitchen. 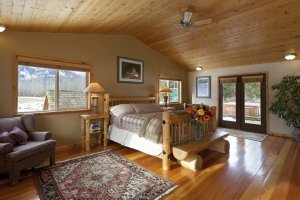 The large master bedroom has a king size bed, ensuite bathroom and walk-in closet. 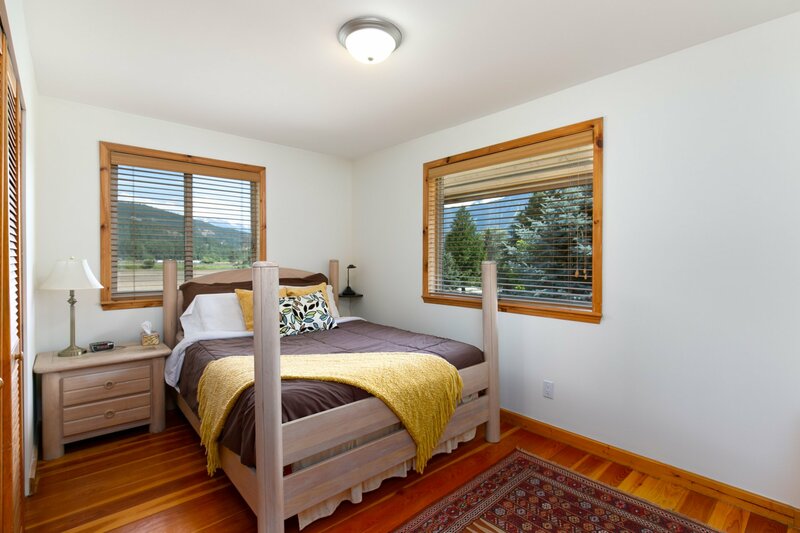 Two sets of French doors open to the outdoors – one to the riverfront patio area and one to the mountain view deck. The other 2 guest rooms upstairs share a 4 piece bathroom. Both have queen size beds. There is now an additional room downstairs with a set of single bunk beds. The kitchen is fully equipped and has an open plan to the dining and living areas. There is a bar with a bar TV that overlooks the kitchen area. There are double French doors from the kitchen area to the riverfront patio dining and outdoor living space with BBQ. The great room is a grand space with vaulted ceilings and a floor to ceiling ledger stone fireplace. It is a comfortable and cozy place to relax. Massive windows that frame the majestic Mount Currie complete the space. There is an upstairs loft area that has 2 double pull out couches, a TV and gorgeous river views. Your backyard is an outdoor paradise with lawns that flow down to the River. Private hot tub - two fire pits – one smaller and just steps from the patio doors – the other huge and down by the river for those who really love the bona fide bon fire! If you have children there is a playground with swings and slides, a trampoline with safety nets and a real tree fort built with love. It overlooks the river and has the best views on the property! Your dogs will love to swim and fetch sticks right out the back door. Outside on the front deck you will find a peaceful lounging area. This is a perfect spot to watch the sun set and horses grazing and playing in their fields. This is olur second visit to Spring Valley Far. Just love it here! This visit was to celebrate our friend's 10th Anniversary and their renewal of their vows. Everything was perfect. We only complain that it went too quick! Now we'll hjave an excuse to visit again, which I'm sure this won't be the last time we have the pleasure of staying here in your beautiful house. Your home is so accommodating and thank you for sharing it with us! Beautiful home! Everything about this place is delightful. I wish we had a place like this in Ontario (one can only hope). Thank you for sharing your beautiful home with us. We have had a great time. I will leave here with fantastic memories that I wiull cherish forever. We hope to have the opportunity to stay again in the near future. Thank you Sue and Justin for allowing us to use this delightful home and garden. It is so peaceful and with a bear in the garden, moose in the river, horses in the paddocks - it coulodn't have been better! Good luck for the future. Just like to say a hige thank you for having us again. We had an amazing time and it was a perfect place to celebrate our friend's 10 year wedding anniversary. It's been lovely staying here in the summer. The views are sooo breathtaking like last time. A wonderful home and a fabulous setting!! We absolutely loved having all our family here together, and couldn't have asked for a more perfect place to say our vows. Thank you so much for giving us your home to use. It wouldn't surprise me if we were back one day. 8 year old - Mabel llikked having both families staying together. 6 year old - Russell liked being able to eat on the warm rocks and look at the best view in town. This was a perfeect spot to host 2 families for the wedding of Brad and Josie. Perfect home base for our celebrations. What a beautiful spot! Will recommend to others. Thank you! Absoluelt beautiful home - perfect fopr our family as we shared in the marriage of Megan and Mitch. We hope we are able to return for a family reunion in a few years! Thanks you for having us here this weekend. We can't wait to have our wedding here in August and this weekend has sure gotten us excited. It was great to see you. See you in August! We had a great time!! We absolutely love your beautiful home - you've got such a gem here! Thanks for all the tips to enjoy the trails and outdoors. We will definately be back! Thank you for such a beautiful place for us to celebrate Easter. Hope to make it a tradition every year. Lisa, Anton, Rebecca, Ryan,Brqad, Melyssa, Lynn, Cian, Hendrik, Ramona, Kelly, Francis, Dillon, Andrea, Jen, Soren, Wesley (the dog), Laura, Steve, Doug and Kat. Your beautiful home is part of priceless memories. What a blessing to you and your family to own this amazing place. It also fits what "feng shui" considers a lucky place! Mountains on one side and flowing river on the other side! May your future grandchildren make priceless memories here too. All the Best and thank you very much. Thanks forletting us stay at the cabin! The property is beautiful and the home is quite cozy. Our group had an amazing trip here and would love to come back in the summer. Thanks again! Thank you for letting us stay here for our weekend getaway! It is such an amazing beautiful place! So serene and relaxing. We hope to come here again in the other seasons and enjoyed our stay here. Tim, Ally, Sergey, Yana, Mike, Nataliya, Andrey and Tanya. The cabin was a beautiful place for our family to get together. We had so much fun. The only problem was it wasn't long enough!! We hope to come back soon and will be staying longer. Thank you for sharing your beautiful home with us! We all had a blast and had the best time together on our first family trip in a long time! Wishing you a Merry Christmas and Happy 2015. Thank you for letting us stay in your beautiful home! Our small ceremoney and delicious dinner with the Collective Kitchen was exactly what we wanted! Hopefully we can come back in the summer as I can imagine how beautiful it must be! Thanks Again. Your gorgeous house added so much to my experienceof Joel's and Vern's "surpride" wedding (well for me anyway). Thanks for being in on the secret. Your home was the perfect venue! Best Wishes -Mrs Hampshire PS I'm going to tell people in Australia about this beautiful place! Thank you so much fopr providing the best possible location for our wedding! It was one thing to stay in such a beautiful home and your friendly welcoming interactions just made us feel special:) We imagine living somewhere just like this, what a paradise! This was the prefect place for our staff getaway! The fresh air combined wuth the beautiful view and cosy area made it so enjoyable. We made the most of the jacuzzi, trampoline and walks in the area, but also the fireplace and a lovely dinner around your family table. Greetings from all around the world! We got together for a farewell party and although we were sad to say goodbye to our friends, we were happy that we were able to spend a great weekend at this wonbderful place! Thank you for making us feel so welcome and for letting us spend such a great time here! What a breathtaking place you have in beautiful Pemberton. We all came from Ottawa, Ontario to surprise Kirk for his 40th birthday. It was awesome to have him come here to find all of us!!!! We have enjoyed our family time visiting, having dinners and playing cards in the beautiful scenery. Thanks for helping us wiht our surprise visit. We could even walk to their house which was an added treat. This was an amazing place for our family to spend some specail time together. Thanks for providing the snowy slope behind the house (but far enough from the roiver:)) for the younger ones to use their "crazy carpets". Thanks also for providing the large deck for the big guys to play hockey! The hot tub for relaxation and spaced for all 15 of us! It was perfect and the sun even shone down on us on Saturday. We had a balst! If it's available next February - we'll be back! What a fantastic place to be with family and friends for Thanksgiving. Your home is truly beautiful and the views are breathtaking. We look forward to visiting again and we thank you for your help when we needed it. Nothing was a bother to you. This place is absolutely astonishing!! We cannot thank you enough for letting us stay here. The setting all around is breathtaking.. We cannot wait to be able to come here again. Such an amzing place for us all to get together and relax, have a good time and celebrate a birthday. Already looking for an occasion to come back! Will definately be sharing the word on this beautiful place. Was above and beyond our ecpectations! Merci beaucoup. Quel belle maison. Nous nous avons repauser dans un environment tres paiselle. Nous avons appreicier votre hospitalite et votre gentelisse. Thank you so much for your hospitality. What a beautiful settting. Well rested. Welll fed and satisfied! Wow, what a beautiful place! The scenery was amazing, the house was comfortable and you were very accommodating. What a pleasure staying here. We will definately be coming back. It's our second visit to your place and won't be the last. Thank you for giving us this opportunity and shared your lovely home with us. We enjoyed every moment of our stay. It was relaxing and comfortable. The scenery, the property and amenities (from the hammock to the hot tubs)—they're just stunning! We've recommended your place to other family and friends and will continue to do so. We can't thank you enough for this past weekend. We couldn't have picked a better place to celebrate Shaye's 30th Birthday. You have an amazing house on the most beautiful piece of property and we can't wait to come back - we're already talking about making this an annual trip! We can't stay away from this place - we love it too much! Spent our wedding weekend here in July 2013, came back this weekend and have another stay booked for this summer. See you soon! Thank you so much! It was an amazing Holiday. You have the most idylic place! Andrea, Mike Azia and the rest of the Gang! Thank you for letting us stay in your beautiful home. My family enjoyed it so much! We will surely come back! Thank you for letting us vacation at your beautiful home. The scenery was amazing! It was a great place to bring the family for some quiet time away. The kids especially (and the dog!) loved running around outside and getting to see the animals. We are all very pleased to have spent our annual vacation here at Spring Valley Farm. Thank you SO much for letting us stay in such a beautiful hoime. We all came to celebrate our 30th's and a celebration was had!! I am still in shock that we could all fit so well in here. Thanks so much again for a wonderful little holiday away from the norm. xoxo Romayne and the gang of 30 year olds! What a wonderful place to bring my Toronto family to. Every direction they looked they saw the beauty of Pemberton - the mountains, the horses in the field, the river. We had a fabulous time at your place. The boys races everywhere - but not to the river. Our daughter's wedding was so special. The venue was perfect. The flowers by Julia were beautiful. The food from a local caterer was the best and freshest and most unique food a lot of our guests had ever tasted. Thank you sor such a wonderful house to gather with friends and family. We will spread the word about Spring Valley Farm. It is such a gem. We had a great time in your spectacular home. We had a fantastic weekend! You have a beautiful home. Thank you for letting us enjoy it for the weekend. We loved it here for the weekend. Thank you for sharing your beautiful space! Thank you. Lots of fun. I like your house and your horses. Thanks so much for sharing your beautiful home with us. We had a great time and want to come back in the Spring and/or Summer. POSSIBLY THE BEST NEW YEAR'S EVER!!! We hope to make this an annual tradition. Thank you from the bottom of our hearts for sharing your gorgeous home, property..... and barn! We had a truly enchanted wedding that will live in our memories for a lifetime. It couldn`t have been any more picturesque or amazing! Our families and all our guests had a thoroughly fabulous time. Thanks so much for helping us give Alan an amazing surprise for his 60th Birthday. Your home is spectacukar and we couldn't have asked for a better place to celebrate. The Grandkids loved the play equipment and all 3 dogs loved the space to run. The hot tub was a huge hit with the grown-ups. Thank you for an amzing weekend! Thank you for letting us use your amazing property! What a lovely spot! Very enjoyable. Dec 22nd - I can see this is going to be EPIC and so much fun with family and friends. Dec 29th - What a great home and time we had!!! What a wonderful home you have! This is a Christmas we will always remember! Thank you so much for your hospitality. What a beautiful property - just stunning! Thank you so much for allowing us to stay here. We had a great time - the views, the animals, the fort and the gardens - wow! All my clothes smell like camp fire and I love it! Thank you so much for an incredible weekend. We absolutely love your home and don't want to leave! We hope to return soon. Thanks again so much for sharing your beautiful home. Thanks for the beautiful house and location to celebrate our eldest daughter's wedding at North Arm Farm. Had we not found your lovely farm, we would not have been able to keep the whole bridal party together. We will remember you forever and wish your continued success. Thank you for a beautiful Thanksgiving weekend. We all felt welcome and enjoyed 2 amazing days. We plan to return and enjoy winter and summer days at your place. Thank you so much for letting us stay in your amazing house. It was perfect! We had a wonderful time and got to see a bear swim down the river! citylightschurch.ca crew up in Pemberton for a wedding. The bon fire was lovely and our hosts were warm and welcoming! Justin and Sue, thank you for the conversations and letting us stay in your home. If we ever come back to Pemberton we will surely make this place our first pick. Thank you so much for accommodating our wedding party, especially my musician friends and myself. We are all hard pressed to think of a place that we've played that was more beautiful and relaxing than this. We will not soon forget your wonderful farm and our deepest thanks for letting us make memories here. Thank you so much! We enjoyed our stray at Spring Valley Farm very much. (The Riverview) Very beautiful and comfortable house and what a view! We loved your place! It is an amazing spot and we really enjoyed our stay here. Tatiana - we want to come back! Lucia - I loved it so much! We had a great time - fish would have been a bonus!! Next time. Thanks for making us successfully forget the city. Your little slice of heaven here is one of the most beautiful properties we've ever seen. Love all the woodwork, the scenery. the quietness. Even if we were just here for the weekend, our stay here is enough to relax and recharge us. We will definately recommend this placeto friends and family and for sure we will come back. Thanks for letting us stay in your lovely home. Your house is beautiful! Amazing view. Awesome place. Very relaxing. We really enjoyed. Recently it was a PLEASURE for my son and I to stay at Springvalley Farm. The accommodations were 5 Star, but the atmosphere was very laid back and easy going. Away from the Hub Bub or Whistler Village, but close enough to partake of any of those amenities if we wished. We couldn't believe the view from our accommodations, and the facilities and amenities provided exceeded our expectations. The piece and quite, and atmosphere there was something we have never experience before. It was like coming home! Anything we needed could be found only a few minutes away in the quaint town of Pemberton. Groceries, Holiday Beverages, Gifts and more. We can't wait for another opportunity to go back. Many Thanks to our hosts Sue and Justin for an unforgettable time! We had a wonderful long weekend stay at Spring Valley Farm. Sue welcomed us with open arms and made us feel as if her home was our own for 3 days. The views were absolutely stunning, the house and all it had to offer exceeded all of our expectations. The photos do not do this place justice. Thank you Sue for an amazing weekend we will be back for sure!